Professional DJs. Real DJ Gear. The Hottest Hits. Peak DJ is proof that Vermont and New Hampshire DJs can drop a beat with the best. We love doing proms! We set up all the lights and fog machines and get the floor jumping by beat-mixing the hottest hits on the request list. We have the experience, enthusiasm, mixing skills, and pro-grade sound and light gear to get the job done. Check out our Reviews, Lights & Sound and Questions pages to see how Peak DJ can energize your VT or NH prom, dance, or college formal. "I have been doing the high school dances and proms for more than ten years and have to tell you that the young woman who DJ'd for us was the best that we have ever had - hands down! She really provided a fabulous program that got rave reviews from all of our kids. We will be sure to seek you out again for our next event. Many thanks!" Hot music is the key to successful proms, dances and college events. We keep our library up to date with all the hottest new songs as well as the old-school hits. Our DJs always take requests and know which songs will pack the dance floor, because we do school events every weekend. Ask other DJs if they do the same. We use only Clean Radio Edits so we can play the hot stuff without getting shut down. We know how to keep a dance floor full! 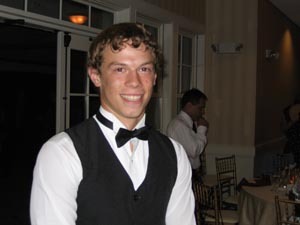 See our NH and VT Prom DJ Reviews page. "The prom was GREAT!​ The DJ was fully prepared well before the students arrived. He was very professional and played music the kids liked, as the majority of them were on the dance floor non-stop throughout the night. I have asked the students if they had fun and one student said it was the best prom she had been to in the three years she has attended. Thank you for providing a quality service!" We use pro-grade dance club DJ gear, not a laptop and a cheap set of speakers. From our Denon Media Controllers to our array of state-of-the-art lighting effects, a professional grade DJ System makes a huge difference in the amount of fun and excitement that is generated on the dancefloor... and the resulting success of your event. Check out our Lights & Sound page for details. "Thank you for doing such an awesome job at our prom! The Grand March went perfectly and the music and lights were awesome! Everyone was dancing right up to the end." Our DJs love doing school and college events! See what our school clients are saying on our Reviews page. If your VT or NH Prom, College Formal or dance has to be done right, give us a call at 802-888-6978 to speak with one of our experienced DJs, or complete our Quote Request Form to receive an information packet and price quote. "Ryan was great and the kids (565 students) had a great time." We've all seen uninspired DJs, doing little more than running Spotify or Youtube on a laptop, letting songs fade out... pause... and start... while bored prom-goers stand around, wishing they had hired a Professional DJ. Many schools have tried the "I know someone who DJs for fun" route and watched people leave their events early. 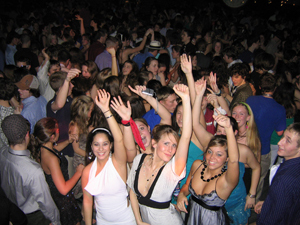 Call Peak DJ and get the excitement you need at your Vermont or New Hampshire Prom, Dance or Formal!